Before going through the FAQs, please go through our simplified notification. I filled the application form of CSE, 2015 once. But I realized that I made a mistake in choosing my optional/exam centre/language/name etc. What should I do? Fill a fresh application form with all correct details. You can even change your optional/exam centre etc in the new form. Submit it online the same way by making the payment again. This form will have a higher registration ID than the previous one you had filled. Only this will be considered by UPSC. Download your Prelims admit card with the same higher registration ID and appear in the exam. A higher registration ID (RID) means the new ID number will be greater than the previous one. If your previous RID was for e.g. 1122, this can be 1546. So, only 1546 number RID form will be considered. What does it mean “General Studies Paper II (CSAT) has been made qualifying”? Will only GS-I marks be counted for clearing Prelims examination? Yes, provided you have scored at least 33% marks in CSAT paper-2. If the cutoff for entry into Mains is 100 marks, it means you will have to score at least 100 in GS, and 66 marks (33%) in CSAT. 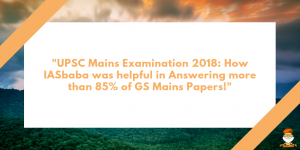 Even if you have scored 99 (less than 100) in GS-1, and 200 in CSAT, you will not be selected for Mains. If I merely fill the UPSC Prelims application form, will it be considered as an attempt? No. Mere applying for the Exam is not considered as an attempt. But, the moment you sign attendance sheet of PRELIMS exam for even a single paper (Say, GS I or II) you exhaust one attempt. If I have given an attempt at Civil Services, is that counted in Indian Forest Service (IFS) Attempt too? No. Your attempt for Civil service exam and Forest exam are counted separately. Even if you have exhausted all your CSE attempts, you can appear for IFS. They are two ‘separate’ recruitments. Only the 1st stage of the exam -prelims is common. Even the application form will have separate columns for CSE and IFoS. While filling the application form, I see “Claiming for age relaxation” check option. I am under 30 age, but belong to OBC/SC/ST/PH category. Do I need to claim for age relaxation? No. The age relaxation, applies normally to any non-General category candidate. Choose YES only if the government has allowed additional attempts. For e.g. in 2014 government increased the age eligibility criterion for General category candidates from 30 to 32. If you have been allowed attempts under such decisions, choose Yes, else No. I am in the last year of College and have still not received my degree. Do I need to provide my degree certificate while applying for Prelims examination? No. Only when you appear for Mains, you need to send its photocopy to UPSC. Original needs to be produced only in the Interview. Will my marks scored in Prelims affect my scores in Mains examination? No. Prelims examination is meant to serve as a screening test only. Once you qualify Prelims, what you have scored before does not matter in Mains.